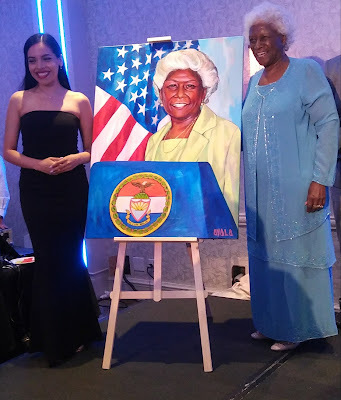 The above photo of former Bronx Deputy Borough President Aurila Greene standing next to a portrait of herself presented by the Bronx County organization as the Lifetime Achievement Award was the highlight of the dinner. 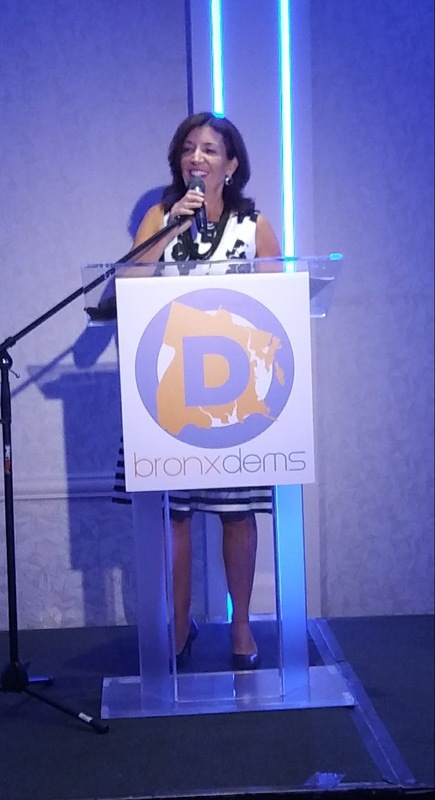 The four Honorees of the dinner were Ms. Rella Fogliano (CEO of the MacQuesten Companies), Dr. Mario J. Garcia (Chief of Cardiology, Montefiore Einstein College of Medicine), Ms. Rosa Garcia (Owner Mott Haven Bar & Grill), and Mr. Joseph Geiger (Executive Secretary-Treasurer of the Metro NYC District Council of Carpenters). Elected officials on hand included Bronx Borough President Ruben Diaz Jr., NYS Lieutenant Governor Kathy Hochol, NYS Comptroller Tom Dinapoli, Mayor Bill de Blasio, Public Advocate Letitia James, NYC Comptroller Scott Stringer, NYC Council Speaker Corey Johnson, State Senator Jamaal Bailey, State Senator Jeff Klein, State Senator Jose Marcos Serrano. 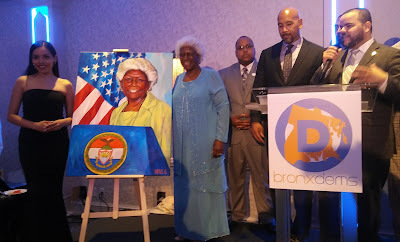 and various Bronx and citywide assembly and city council members. 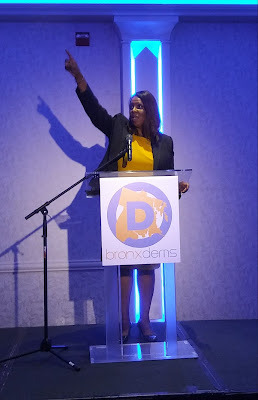 The photos below should tell the rest of the story. 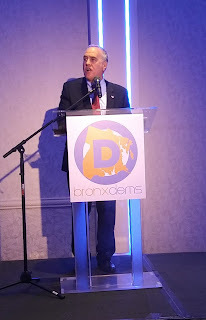 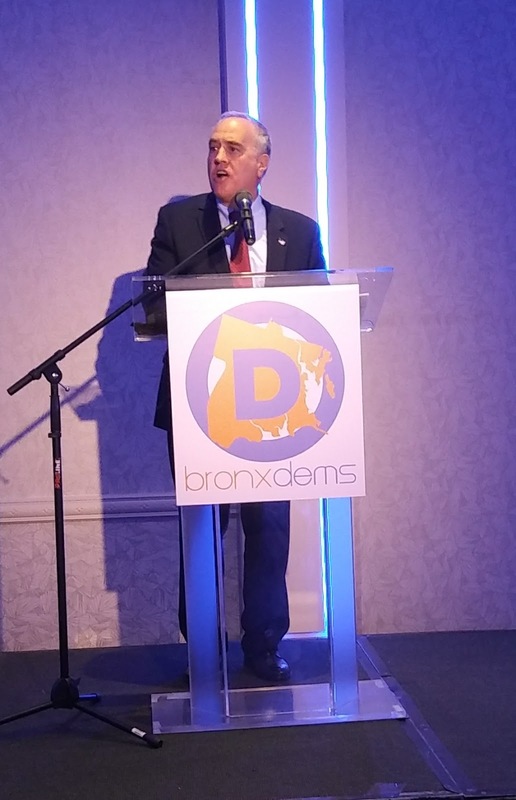 Below - NYS Comptroller Tom Dinapoli. 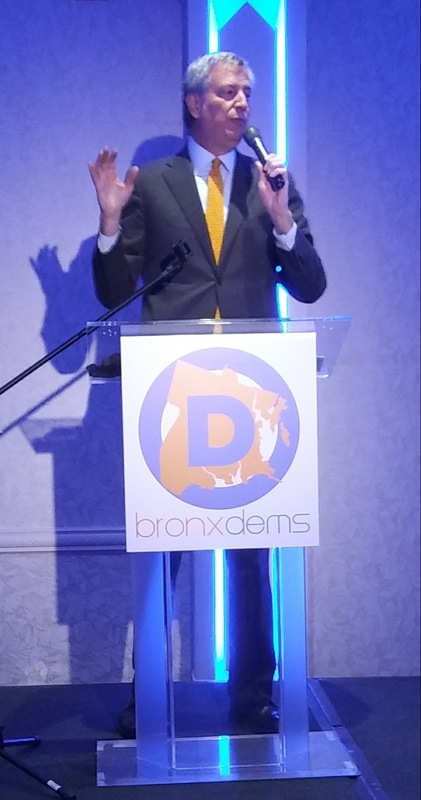 Above - Mayor Bill de Blasio saying that as is well, and Bronx BP Diaz Jr. is doing a great job. Below - Current Public Advocate (and candidate for NYS Attorney General) points towards her goal of going to Albany. 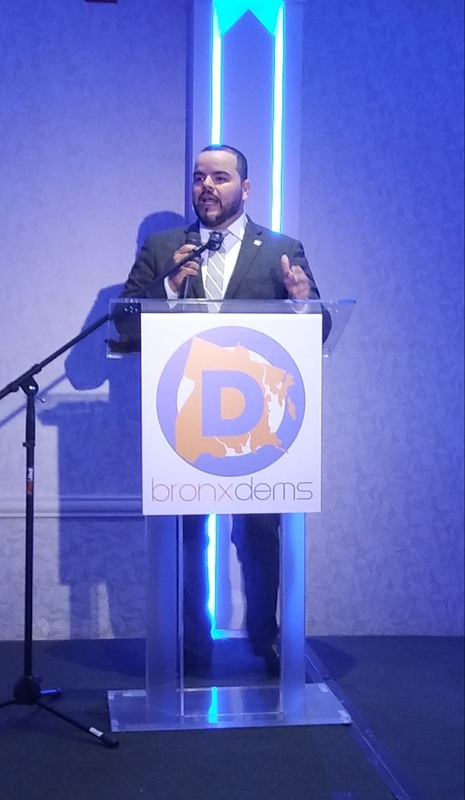 Above - Bronx Democratic County Leader Marcos Crespo. 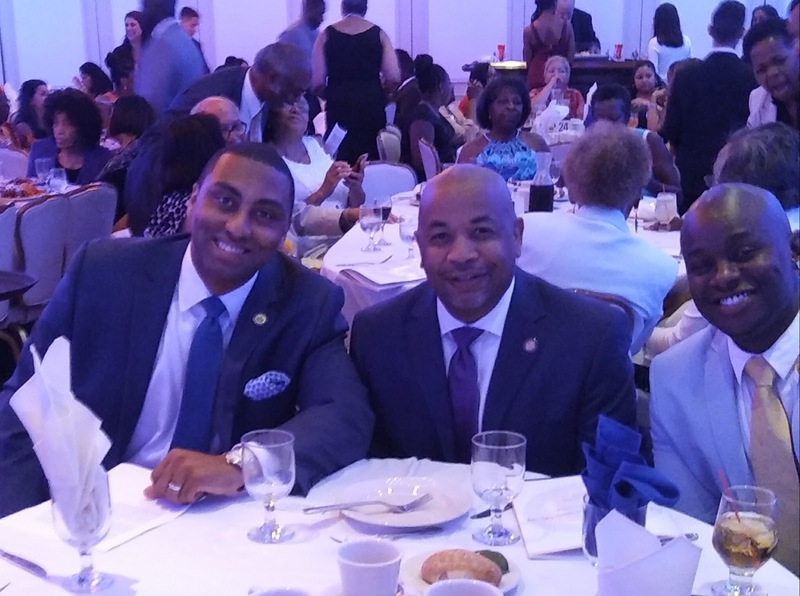 Below - State Senator Jamaal Bailru with NYS Assembly Speaker Carl Heastie, and the Democratic District leader from the 83rd A.D. 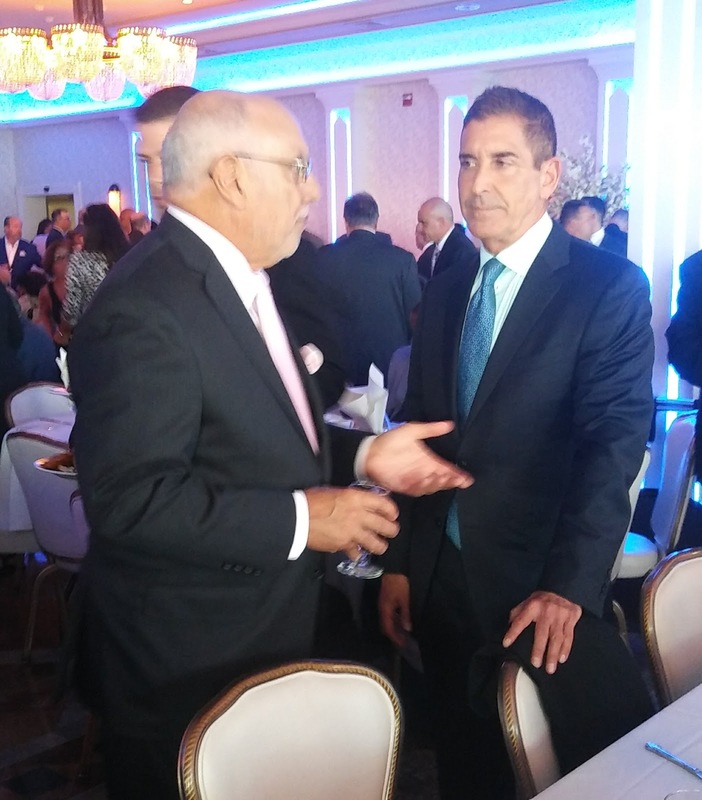 Above - Is State Senator Jeff Klein getting some advice from Assemblyman Michael Benedetto on Klein's current tough re-election bid?